The Firewall page is a real-time version of the firewall log viewer with some filtering options. All entries in the firewall log are from packets that have been blocked by the Smoothwall.  Go to Reports > Realtime > Firewall. The firewall log is refreshed every second. 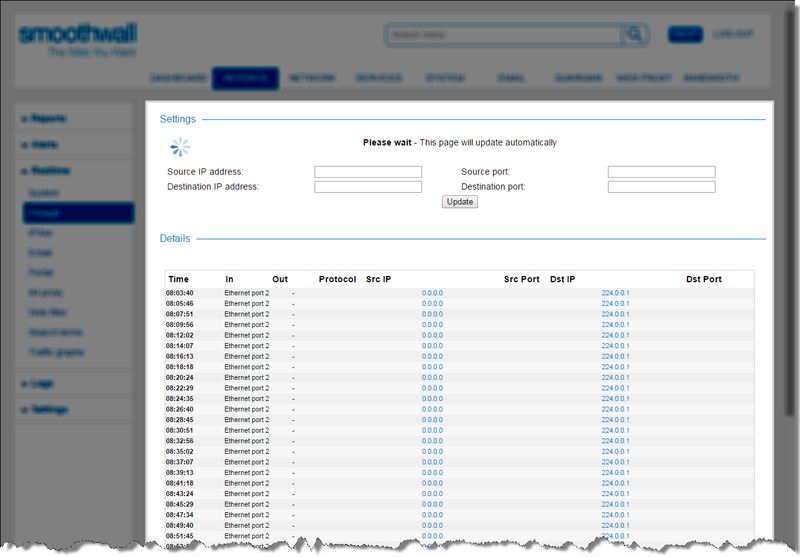 You can choose to filter the firewall log to only show information from specific sources or destinations. 1. To search for information from a specific source, enter the IP address in the Source IP address field. 2. Optionally, you can choose to specify a port number in the Source port field. 3. To search for information to a specific destination, enter the IP address in the Destination IP address field. 4. Optionally, you can choose to specify a port number in the Destination port field. 6. You can also use an asterisk, *, within the Source IP address and Destination IP address fields. For example, 192.168* to search for all IP addresses starting with 192.168.